By Studio PAUSE regular Colleen Moore, Arlington, VA. I love the National Book Festival. It is a great way to connect with some of my favorite authors, see them speak, buy their books, and get autographs. As a budding writer myself, it is an invaluable chance to hear actually successful authors talk about the craft of writing, what inspires them, and their process. Last year, I went with a friend of mine from my writers group. We sat outside in one tent so that we could see Khaled Hosseini, the author of The Kite Runner, speak. He was the last speaker of the day. We wanted to be right up front, so we camped out all day. Typically, as in every year since its inception, the book festival is held out on the National Mall in Washington D.C. This year, however, they decided to move the book fest to the convention center. This was a highly controversial move. People have strong feelings about where the book fest should be held. Many people hated the outdoors. You are subject to the elements. It could be too hot, too cold, rain, and I have been to the book festival under all of these circumstances. Other people, such as myself, love that the book fest is held on the National Mall. 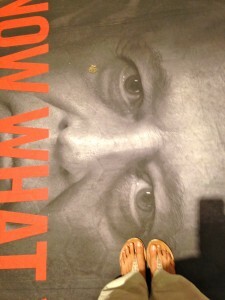 You can see famous authors, look at the capitol building and surrounding Smithsonian Museums. Yes, it can be too hot, too cold, or rain. You can get sunburned, etc. But it’s the National Mall! You have a sense of place and purpose. It’s awesome. I groused quite a bit that all of this would be lost inside the sterile, climate-controlled convention center. This year, I went to the book fest with my brother and then met up later with my sister. I was complaining about the loss of atmosphere to him as we walked into the convention center. I was forced to immediately re-evaluate my position almost as soon as I walked into the place. They have a lounge, free wi-fi, and several coffee places, including a Starbucks. The nearest Starbucks to the National Mall is a good 7-10 blocks depending upon where you are on the mall. Yes, you can get coffee in the castle or any of the Smithsonian museums, but it’s over priced and mediocre at best. And that’s me being very generous. If I’m going to pay in excess of $2 for a cup of coffee, I want it to be good. My brother really wanted to see Sandra Day O’Conner. I did as well. I am of a different political persuasion than the former justice, but still, she was the first woman ever appointed to the Supreme Court. I was very excited to hear her speak. We spent some time googling Supreme Court cases she had adjudicated. My brother really wanted to ask her a question. We were very disappointed to find out that she was there to support her brother’s book on horses. I’m sure it’s a great book, but it’s not what we wanted to hear her talk about. Our research was for naught. We listened to them talk about horses and left disappointed. My brother did not stay long. I had determined to stay all day. Shortly after he left, my sister arrived. She took the metro into the city. We had a very long Facebook conversation as we tried to find one another. Unknown to her, we were posting where everyone could read our posts. She thought she was messaging me directly. When the posts stopped, our friends starting posting things like, “What happened?” “Did you find each other?” It was quite amusing. She was very interested in buying books and getting autographs. While my brother is a history, Supreme Court person, my sister is a science, math, physics person. I am more of a novel, history person. She wanted autographs, I wanted to hear Lisa See speak. I read her mother Carolyn See’s book on writing and had read Lisa’s Snow Flower and the Secret Fan. I had to see her. 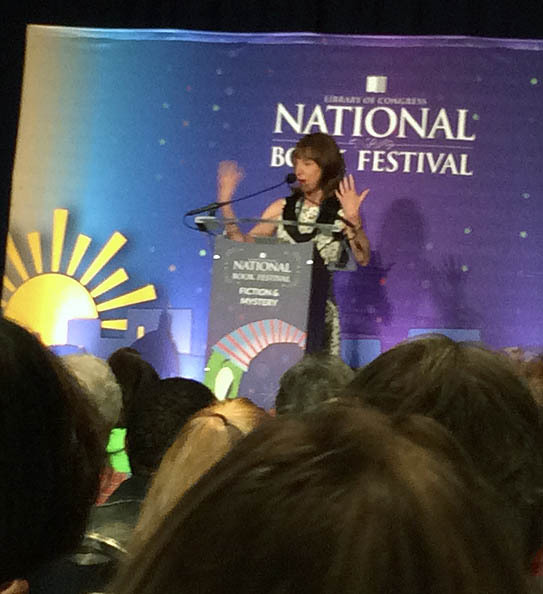 I helped my sister get her books and get a few autographs, then I abandoned her to get to Lisa See’s lecture. Lisa See is fantastic. She’s smart, funny, witty, sophisticated, an excellent writer and storyteller. I’m glad I got to hear speak. My sister did get to hear the end of Lisa’s speech. She messaged me, this time privately, and I met her in the back of the room afterwards. She had one more autograph to get. She wanted an autograph from Michio Kaku. He wrote a book a few years back called Hyperspace, but the book he is currently selling is The Future of the Mind: The Scientific Quest to Understand, Enhance, and Empower the Mind. He’s a physicist apparently, and my sister has read at least 4 of his books. He is remarkably popular. While she did not have to wait for most of the author’s autographs, we waited over an hour for his. He even stayed extra time to make sure everyone who had purchased his book and wanted an autograph, (and a picture with him!!) got one. My sister chatted with him very briefly while he signed her book. He’s a very nice person apparently. We were in line for so long we had missed any other opportunities to see other authors speak. I was a little disappointed, but we had great time. I spent the day with my brother and my sister and we were able to share in something that we all love: reading. Yes! It’s almost been a year that I started Studio PAUSE. The new lease forms are on my desk. There is one repayment left of my KIVA Zip microloan. The carpet is stained with pink paint and muddy footprints from a spring field trip by 140 first-graders. But, sadly, the awesome guitar studio next door has closed shop. And the ASL interpreter to the Studio’s right has not renewed her lease. And so, before I share my new ideas for Year Two with you all I’d love to hear from you. Please take this short survey below so I can understand what worked for you and what didn’t. I really appreciate your time. It will help me plan and hopefully, we can both have a great Year Two. 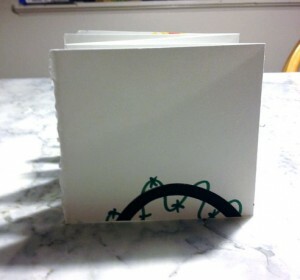 It was 2008 when I met Richard, an elderly gentleman who had seen my Handmade Storybooks at an exhibit in Alexandria, VA. He contacted me and told me his wife had told him a story and he had written it down when she was unwell. She had since passed away and he wondered if I could design, print, and bind it into a unique book so he could share her story, ideas, and glimpses of her life, with family and friends. “You know that phrase also appears in the Torah,” he smiled. I had had no idea! I knew a calligrapher who did Hebrew lettering and she wrote the phrase to look like Hebrew script. Last week a friend looked at the page I had printed for the new edition and she said,” You know, we don’t say God…” and she shrugged. Reading more about Richard’s wife I found she loved and collected dollhouses and saved them for when she had daughters. But she had sons. I used the dollhouse to inspire my artwork for the book. The book, Shura, has lace curtains, rocking chairs, and doors that open and close. I also found paper with sand pressed into it—red sand—which will fall off as you handle the book over and over, just like he red dust in the story. 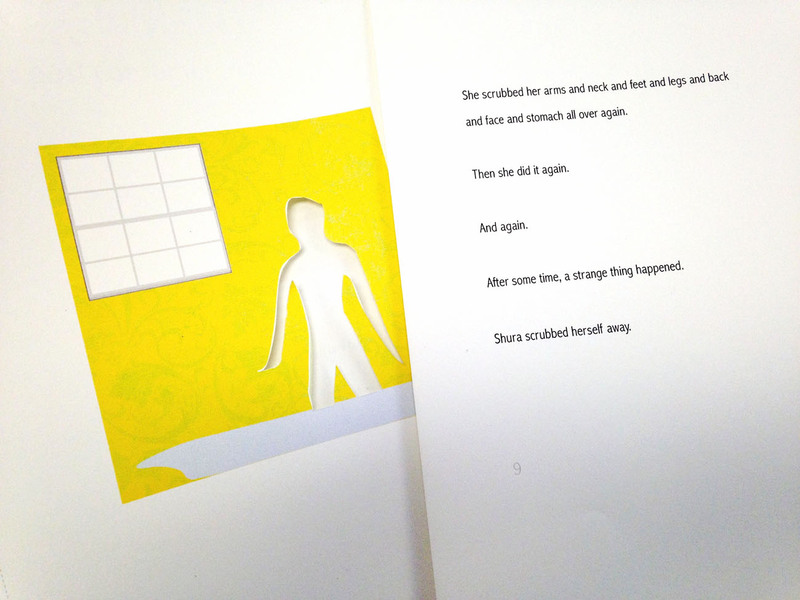 And at the end of producing the first edition of 35 copies I found the floor covered in little girl images I had cut out from the inside page where she scrubs herself away (picture above). I couldn’t possibly throw them in the trash! As she does come back in the story (and inspires her aunt to go rolling down the hill with her) I glued her on the back cover of the book, without checking with Richard first. As I stood in an empty church parking lot one evening transferring boxes of books from my car trunk to his I showed it to him. I remember—he had loved the idea and was so happy. New covers for Richard’s book The Queen & The Crocodile. 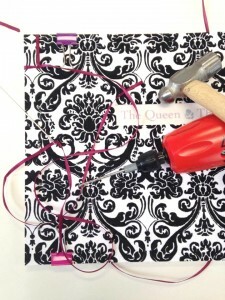 The books are drilled, sewed with satin ribbon, and hammered flat. Soon after Richard had another story—another amazing one called The Queen and the Crocodile. Printing those pages out last week I couldn’t believe I had made those collages all those years ago! Mists out of carefully curved vellum, and a rough crocodile with googly eyes. They were pretty cool! 🙂 But the creativity continues as the papers I used for the covers then are not available anymore and so I redesigned them. I tried out various options and then settled on one with focked paper in Victorian designs. I hope Richard likes the new look of this book. Since I worked on the first editions he has moved to Richmond, VA, so I will not be able to see his face when he gets the books. I know I will miss that experience. But I have his amazing stories and the wonderful art I got to create so I’m happy no matter what. The last week has amazed me. If any of you reading this have visited Studio PAUSE, you know exactly how tiny 400 sq. ft. is. Yet, events in the last week have proved that a small space is no excuse to hold you back. When I was planning to open the Studio seven months ago my 7-year old had wanted me to invite her first-grade teacher. When the teacher came to the opening, (where, by the way, we have 107 people visit over 3 hours!!) she told me she wanted to bring her students there on a field trip and I had to plan a lesson. When I shared the lesson with her, The Blossom Walk & The PoeTree Project to celebrate National Poetry Month, she shared it with her first-grade team and they all wanted to come! 140 first-graders, plus 35 chaperones and teachers! I did pre-lessons in each classroom the week before telling the students how a Japanese painting of a cherry blossom tree full of poetry slips inspired me to do this project to celebrate all the trees blossoming in our neighborhoods. And then I taught them about Haiku. I gave the teachers slips of handmade Korean paper for the children to write their poems on. So we planned 3 trips with two classes each—50 kids and about 13 adults. They walked from school and it was a gorgeous Spring day. 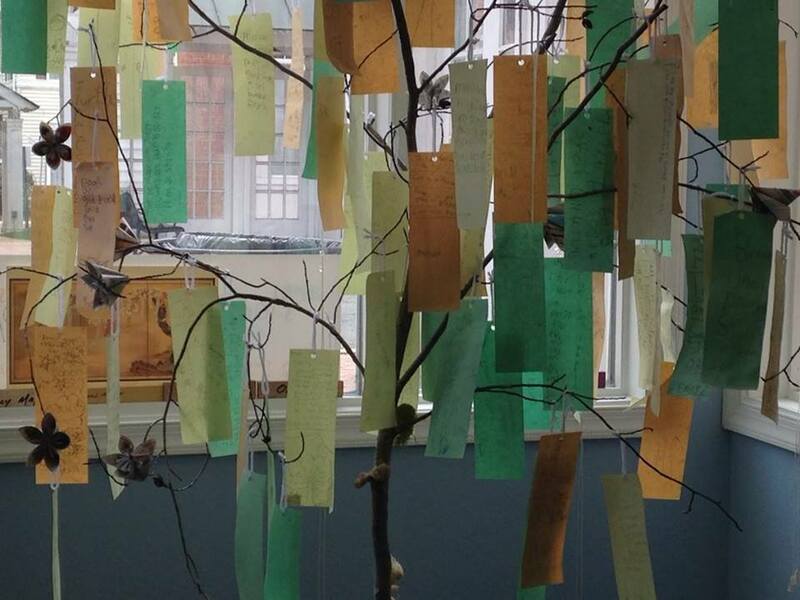 The PoeTree was generously created by David Leggett, master cabinetmaker and my friend’s brother who had heard us worry about creating a tree indoors that would hold 140 poems. Sharmila Karamchandani, professor of graphic design at Art Institute and a dear friend was curious and offered to help out as it was her spring break week. 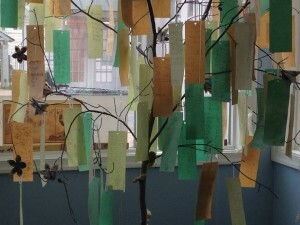 She made 30 origami cherry blossoms out of coupon books to decorate The PoeTree. Inspired by the children’s poetry as she hung up the poems after the children read them aloud, she also learned how to write Haikus. “Hundreds! Thousands! Millions!” the kids replied looking around at my artwork on the walls, the exhibit Branching Out—Found and Lost by John Heyward Smith and David Leggett, the handmade storybooks, and the art and writing on the PAUSE Wall shared by visitors. The PoeTree goes to Oakridge Elementary School at the end of the month so families can enjoy the creativity in the community decorating a lifeless branch transformed into The PoeTree. 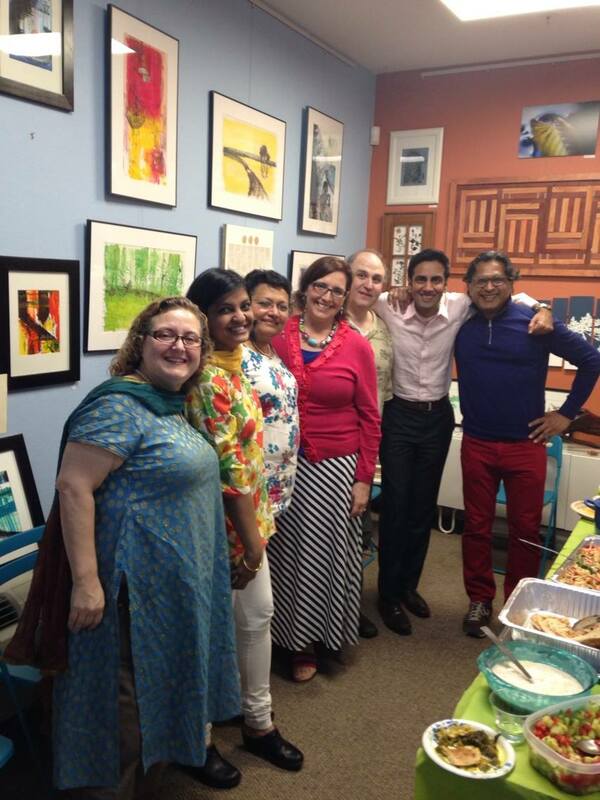 Then, last Sunday, The PoeTree witnessed the Indian Dinner Fundraiser we did to raise a scholarship for EWI. Marga Fripp, founder of EWI and an amazing mentor to me, suggested I try fundraising as an Ambassador of EWI and I was on board. I knew that without the support of the wonderful staff and volunteers of EWI I and their training program I would never have been able to do any of this. I got inspired at an EWI event I went to with my friend and long-time buddy of Studio PAUSE, Colleen Moore. There, I heard Aida Mady speak about her journey in cooking and how her catering business took off because people love to eat—and it is the easiest fundraiser. The crowd chuckled, as we ourselves were soon going to eat her delicious Egyptian cooking. Colleen said, “I can cook Indian food too, so I’ll cook my famous Saag Chicken and join you!” Her recipe—gluten-free and dairy-free—was up on her blog and I checked it out. Others who have enjoyed the Studio wanted to help out too—in so many different ways—and the PAUSErs for a CAUSE Indian Dinner Fundraiser idea happened. As I got cold feet, Colleen’s emails and texts about “I’m so excited!”, “Chicken is on sale at Harris Teeter!”, and “I got Indian clothes to wear to the event!” warmed me up. I went and got the chicken and the greens and pulled out my mom’s recipe. As I thought there is no way I will be able to raise enough money, Cecilia decided to donate the proceeds from the sale of her artwork in the March show to start off the fundraiser! My friend Anne Marie and her daughter Meghan—the power bakers—baked cupcakes with mango frosting and coconut (I kept all the extra frosting… be right back…) She also went with me for 10:30 pm shopping trip to get tablecloths, plates and cups etc. Then my friend Partap offered to create a special Bollywood playlist for the event and bring in his awesome speakers. Amar wanted to come down from Annapolis and cook with me and so he put all the ingredients and his big blue pot in his car and drove down and cooked Chana at my house. Andy said he’s make his special Chana Masala and tea-flavoured rice which was yummy. Doler, seasoned restraunter and EWI graduate herself, took charge of the vegetable biriyani and salad. I got the samosas from our trusty old India A-1 Grocery and the owner donated big foil trays and take-out boxes to the cause. The Mango Spritzer with mint was the beverage of the day, a recipe that is my son’s favorite. And then I got so excited I also made my special paneer dish, (not available in any restaurant), raita, naan, and a cucumber-tomato salad. Twenty-two people came and ate, many friends who couldn’t make it donated online, and even as I write this today, my friends are donating to the cause and coming down to get the leftovers! (Thankfully, Indian food does great as leftovers :)) Many friends who stopped by had not had a chance to visit the Studio before. There were even friends of friends who I had never met before—thanks, Loredana for inviting them! Guests got dinner, art, read poems on The PoeTree written by the children in the neighborhood, and bought wooden creations by David, some of which he created collaborating with his 92 year-old mother who visited just the other day when we had the reception. There was also a future EWI artist and her cameraman reporting on the event for a middle eastern TV channel. 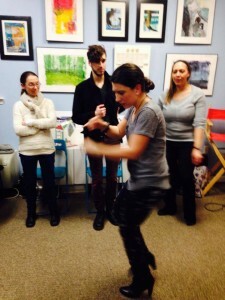 There was spontaneous Bollywood and Latin dancing, interviews, donations being taken in by EWI intern Lauren Spengler, and to top it all, as we were winding down someone noticed faces in the window. When I ran out to see who it was, it was a family of a little girl whose poem was on The PoeTree and she had brought her family and visiting grandma to show them the new Studio in their neighborhood! Yes, I know. It sounds frantic, hectic, and almost crazy. But isn’t it awesome? It is my Studio but really it is the Power of Everyone. Everyone makes a difference. Everyone wants to help and contribute. Everyone has something special to share. And its a tiny space where Everyone is welcome! As my twelve year-old son made me sit down to watch his favorite Dr. Who show one evening it struck me that in some ways, the Studio is just like the TARDIS (I know, I know, but read on…)—Small on the Outside but really Big on the Inside. Big enough for every idea you might have, big enough for our entire community, big enough for everybody’s imagination, creativity, and generosity. And I couldn’t have done any of this without the Power of Everyone. So I thank you all from the very bottom of my heart. If you’d like to donate today, one day to give to PAUSErs for a Cause, please click here. It was Oct 2011 when I was walking down the main hallway of the Torpedo Factory in Old Town Alexandria, VA. I had organized a seminar there the previous Friday and somebody had lost their computer cable. I was there looking for it and asking around but nobody had found the cable. What I did find though, was the Day of the Dead exhibit put up by students of The Art League. Someone knew my name but I couldn’t place her at all. “You probably don’t remember me…” the lady began. It was Cecilia. She had volunteered at the Del Ray Artisans Summer Camp for children some months ago when I was teaching my Explore Arts of India camp there. She remembered me taking Indian sarees for children to look at, try to wear, and find paisleys in their intricate designs. She remembered me telling the children that paisley designs were inspired by the pine cone but was also called the mango design. Anyway, she said all this to the other lady she was with, who was her Art League art teacher, Marsha Staiger. They were there to take down the Day of the Dead show. They talked, we chatted, laughed, looked at art, and all the while I really loved the thing they had. “You should come check out our class. You might like it!” Cecilia said. I hadn’t had an “art teacher” since I was 18 and even then can hardly remember having so much fun with any of my art school professors. The last time I had actually painted was when I was 18. After that it had been typography and photography and then work in advertising. I had enjoyed creating ad campaigns, designing layouts, packaging design, logos, newspaper ads… Since I gave all that up I have mostly been working alone. Writing, researching, learning book arts, designing books, printing and binding them myself in my basement or in my small, shared, studio space. Then another voice—“Is that Sush?”—it came from the other side of the art panels and was my dear friend Kathlyn, also an Art League teacher. When I told her later that I wanted to take the class Cecilia takes she told me I would love it as Marsha was an amazing teacher and so I committed myself. All day every Monday for 9 sessions. And just like that, thanks to Cecilia, my life changed. I loved painting Marsha-Style! The class was fun and there were amazing things I could learn from every single person in the class. I was starting from scratch but it was amazing to realize there was a lot I knew already—even before I put the brush on the paper—and it showed by the time I was done. 20 years in advertising wasn’t so bad after all! I painted, I played with color, I danced with text and songs and included them in my work. Painting freed me from the small sizes of my books, which were smaller than half-page newspaper ads. Marsha made us frame things and enter them in shows. By the end of 2012 I had had my paintings in various shows, sold a few of them, and also won Best in Show once. She took me to the guitar studio few doors down. “Let’s go in and ask him,” and before I could stop her, we were inside, settling down on a couch, laughing and asking questions. Meanwhile, I decided to take on the space. The landlord seemed nice and the sunlight in the space was awesome. 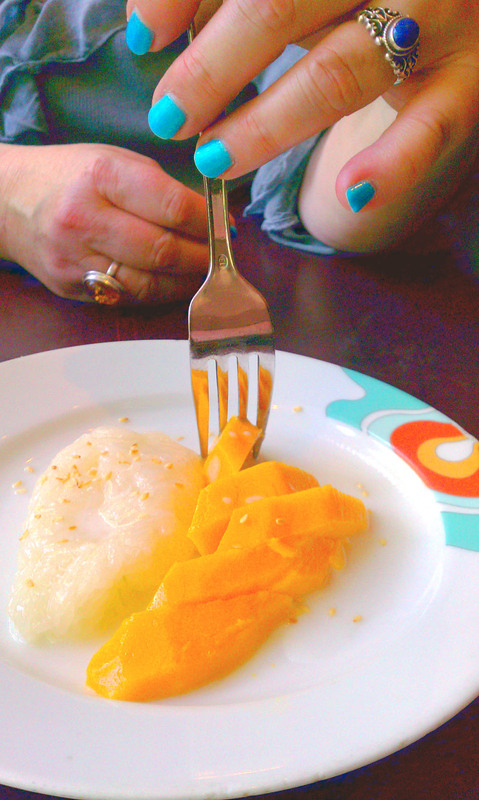 I had taken a photo of Cecilia’s manicure and the plate of dessert at a Thai restaurant we had eaten in one afternoon. That would inspire the colors of my logo for Studio PAUSE, a space where you make time for creativity and celebrate the creativity of others in the community. But I couldn’t afford Marsha’s class anymore and I knew I would miss painting and the camaraderie. It was the first time that I would be alone in my art studio and I worried—what if I produced nothing? But Cecilia had an idea. “Can I come in and paint with you for a few hours every Monday?” She could sit and work on small pieces instead of standing and working at an easel. We could go visit Marsha’s class sometimes too. We would still enter our work in the Art league shows. She would come in after her water aerobics class. 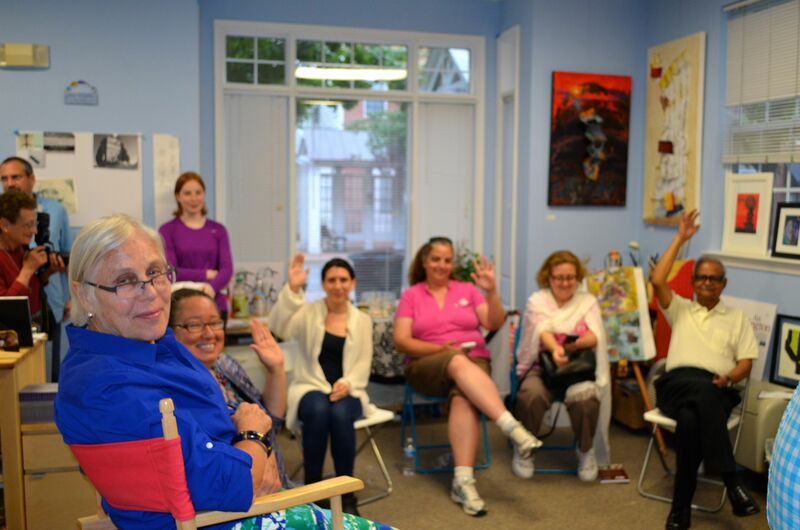 “Yes!” was my answer, and ever since I opened Studio PAUSE in Sept. 2013, Cecilia has come in on Mondays and painted. We laugh, we worry, we eat, we paint and play, talk about the kids, and explore ideas. We share stories of travel and movies, get angry on current issues, and share earrings even. Cecilia donated her surplus art supplies to the Studio and left her art there as well so she didn’t have to lug it in and out every time. As her ankle healed, other visitors saw her work and got intrigued. They wanted to try it. They wanted to buy it. How much did it cost? How much does art cost? Why does art cost what it does? What if you didn’t frame it or put wire on the back? What if you could pay some now some later when you had the money? 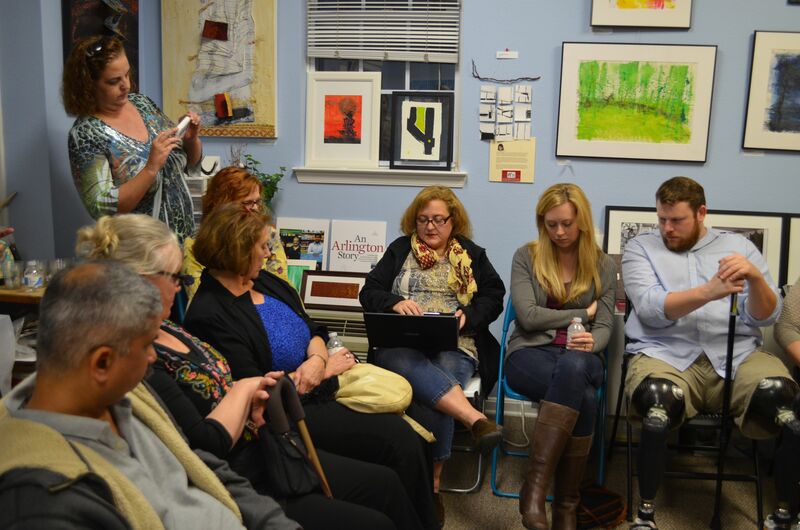 We ask all kinds of questions at Studio PAUSE and then tried it all at Candy Shop, a sale of art by Cecilia in December 2013 where everything was from $10 to $40. Artwork that was small, yummy, zero calories, and inexpensive. We downloaded songs to go with the theme—Nostalgia: The Candy Shop. Facebook friends contributed their favorite songs too. It snowed that day and Cecilia couldn’t make it, but others did and Candy Shop was a hit! So I asked Cecilia if she’d like to have a show. Of course she didn’t! Her work all over a full wall? No way! Meanwhile, others started coming to the Studio on Monday for Art PAUSE and painting alongside Cecilia and me—many who had never painted before. We worked on paper, tiles, cardboard. 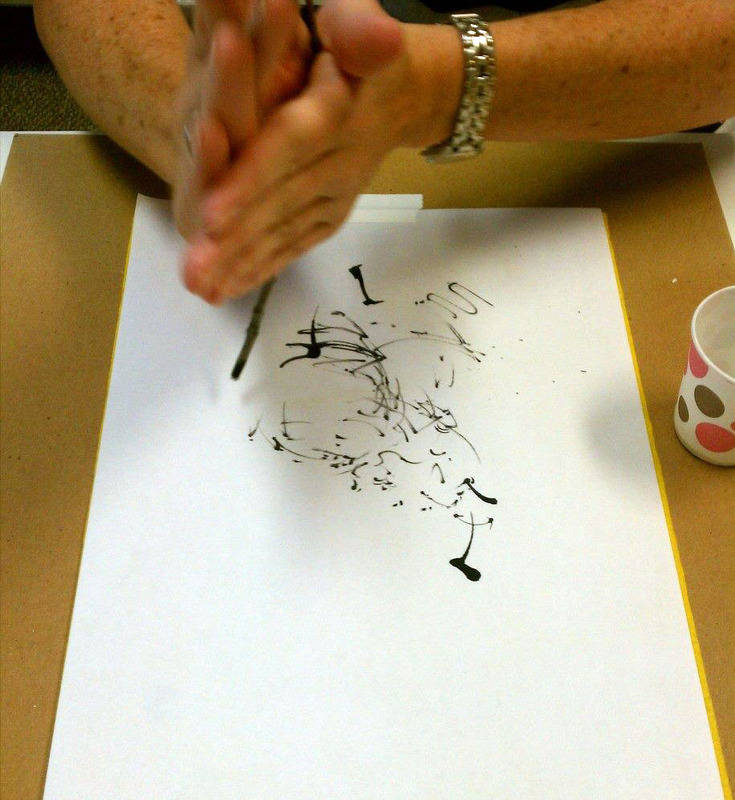 We worked with brushes, brayers, and “kabob sticks.” Making art is not just about you and your ideas. It is about learning, exploring, playing, and feedback too. How many everyday people have watched an artist work? Questioning, failing, changing, collaborating, celebrating—all of these are part of the artist’s process. Then one day I get an email from Cecilia. “Yes, I will do the show. I think I am ready!” Her basement studio had been renovated. It had great light and a well organized space. Her art was flowing. I hadn’t even thought of that. But how absolutely fitting! Thanks, Cecilia! None of this would have happened without you. Tannia’s love for dance was catching, to say the least. Being a “businesswoman” is hard but then Studio Pause is also, my own studio, my work space, my space to dream, so when I got back I dug in. And then it started… January 2014 has really been about people who have visited Studio Pause since it opened coming up with their own ideas of what they want to do there. We have a painter starting an Art Critique Group, where you bring in your work and others give you direction and compliments. A writer is gathering people for a Writing Critique Group. 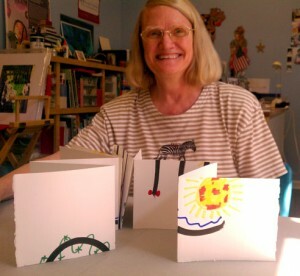 A Mom wants Open Studio time to work on a book of stories for her daughter, and two other moms agree and want to join in. Another person asked if she could come have lunch at the Studio. It gets lonely at home sometimes, she said, and she’d rather be surrounded by art and writing, ideas and energy. So someone decided on calling it the Zarzuela Lunch Pause—where you bring your lunch, eat together, and share ideas and stories. At the first birthday party at Studio Pause, a guest said how it was hard to finish a bottle of wine alone so how about a Wine and Stories Group? Why not, I said. As long as it is about art, stories, or community it works for Studio Pause. So, starting in February, there will all sorts of new things starting at Studio Pause. Find out more, and come, gallop with us! Can One Word Tell a Story? Kaipoché! – Story of a Word. Accordion book sewed onto canvas, acrylics, caran dache, twigs, foil. Should it be it Kaipoche!? Or maybe Kaipochey!? The way we used to scream it it should be written more like Kai-po-chéééé!!! Actually, the title of this story is a word I didn’t even know the meaning of until my first solo show at Glen Echo Park where my friend told me the meaning. But it is a word I have screamed many times (yes, it was always screamed) from the roof of my apartment building in Bombay, India, on many Januaries in my childhood. We screamed it every time my brother, or one of the kite-flying friends who lived in our building, cut someone’s kite on the festival-day of Makar Sankranti. Yet, I have no idea what language the word might be in and what it would translate into in English. “We cut your kite!” might be a translation, I guess, but it is definitely insufficient. After all, our kite string, that special pink manja, was covered in ground glass, its only job being to cut other kites. When our building boys cut someone’s kite we would scream Kai-po-cheeee!, and watch the unfortunate thing float away, its string trailing over the distant neighborhood rooftops even as kids jumped to try and grab it and make it theirs. But when one of my brother’s kites got cut and everybody except us was screaming Kai-po-cheeee!, I would drop the firki—the reel of manja I held for my brother—and run down the three floors and into the street. There, along with the many street kids carrying long sticks, we’d chase our kite, our eyes on the sky. They would try to grab the trailing kite string with the tip of their sticks and make the kite theirs selling it on the street corner later. But they were not going to get one of my brother’s! I would fight them—at least that’s what I seem to remember—and bring my brother’s kites back to him. Today, my brother lives in Singapore, my other kite-flying friend, Anoop, in Toronto, Canada, and I live in Washington DC. In a sense, we have been Kai-po-cheeeed! too and caught in the tips of different sticks, far and wide. As time goes by childhood symbols often change meaning and give us a chance to look at things in a new way. Always the same kite, but escaping some hands, picking new sticks. As for the word, I now know that it is in the Gujarati language and means I am cutting it. But don’t try asking everyone from India if they know this word. My friend from Vashi had never heard it. I guess it was a Santacruz or Gujarati-suburb kinda thing. Happy kite-flying! Wish you blue skies forever! She Built It, and They Came. 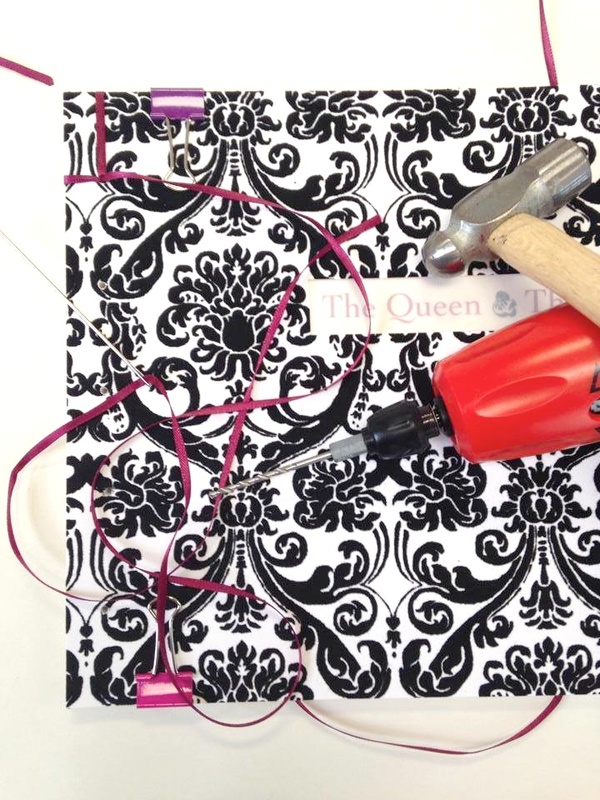 Lisa Bogle added this to the Studio’s PAUSE Wall in Sept.
By Guest Blogger Lisa Bogle. I’ve made myself believe I’m pretty cynical. Most people who know me would probably describe me that way. But it’s just a shield I wear. So that when things don’t work out, I can say I knew it all along. Of course, it doesn’t really work. The pain gets through. It always does. And the cynicism only keeps me from letting myself feel it, heal it, and move past it. But there’s a place where, over the last couple of months, I’ve felt that cynicism lift. A little bit at a time. But it’s going. And I’m not sorry to see it go. I’m starting to believe in magic again. It was begun by a friend who is, by far, the least cynical person I have ever known. And she’s put her heart and soul into something that can only heal the community it inhabits and the people it touches. The place is Studio PAUSE (People, Art, Understand, Share, Explore). The person is Sushmita Mazumdar. “Who among you is a writer?” One hand, then two. Then more! Since its opening in mid-September, there have been three Community Pause events. These are events where members of the community are invited to come share their own stories, artwork, poetry, food, and fellowship in keeping with the theme of the current exhibit, whatever that might be. 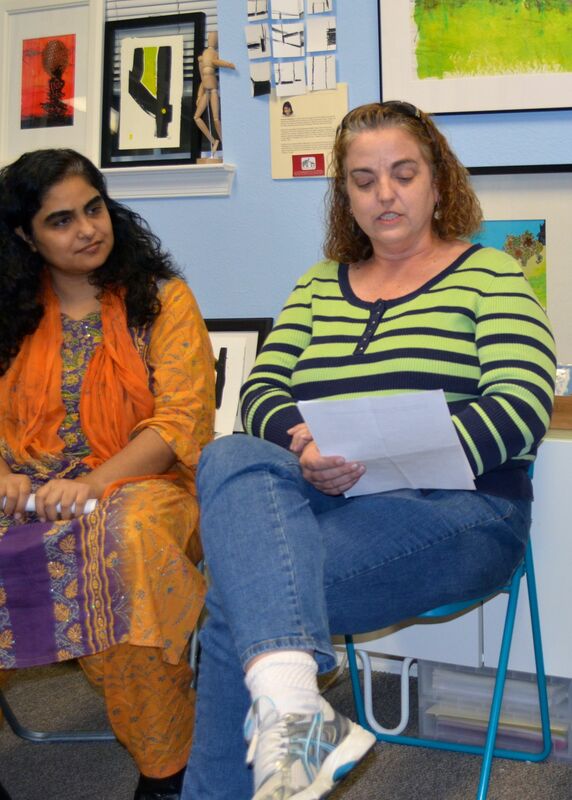 At the first Community Pause event, the theme being “Black and White and History,” community members heard from photojournalist Nina Tisara, who explained the artistry behind black and white photography in capturing people. Historians Audrey Davis and Christa Watters, two of the authors of the new book African Americans of Alexandria: Beacons of Light in the Twentieth Century, told some of their favorite stories from the book. We then heard from Howard Feinstein, sharing many stories from the civil rights movement. Lisa photographs Colleen, who tears up as she reads from her blog. 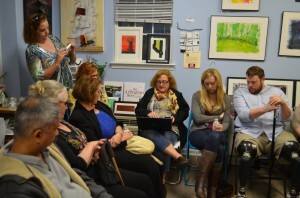 At the second Community Pause, the theme was “Black and White and Life and Death.” We listened to photographer Ken Marti talk about his exhibit, “Black and White…And Absence,” it’s poignancy and beauty and unexpected humor. 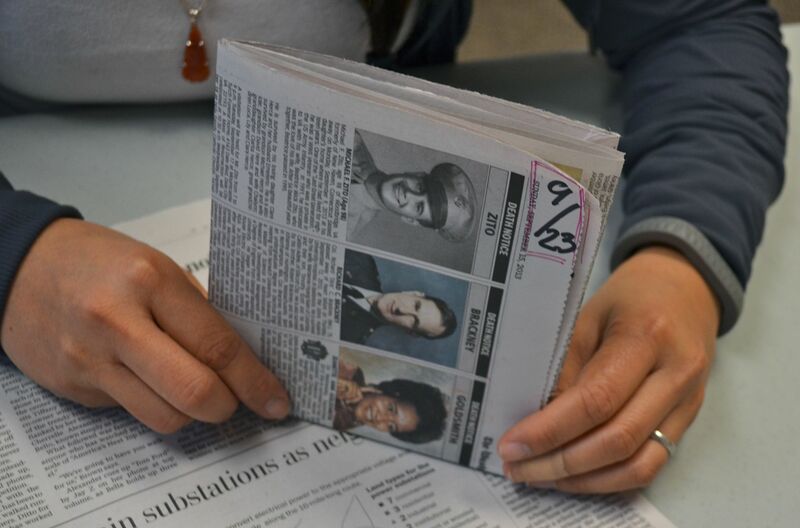 We were honored to meet the subject of these photographs, retired army Staff Sgt. Charles “Chaz” Allen, who lost both legs when he stepped on an IED in Afghanistan. He and his wife shared many stories about his injury, his recovery, and his readjustment to his new life. Mr. Marti also shared a very personal book he created to chronicle his wife’s journey through (and recovery from) cancer. In addition to a very engaging conversation that was sparked from these special guests, others shared their own ways of coping through art. 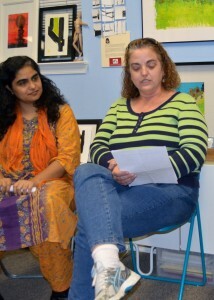 We heard a short story from Terence Kuch, a poem from Shabnam Samuel, and a blog post from Colleen Moore. Each of these people shared how their art has helped them through a difficult period in their lives. The conversation went well past its scheduled time and might have continued even longer if people didn’t have to get back to their lives. The third Community Pause event was themed “Nostalgia: Celebration!” Community members were encouraged to bring art, essays, poetry, food, and of course stories that represented nostalgia and celebration. Instead of a formal exhibit, which will open later in the month, (Nov 16th to be exact) each person was invited to share personal stories, which they did. The event was more intimate, and the informality led to more sharing of stories than even originally planned. It too went longer than scheduled. The presentations became conversations, which led to more conversations, and more ideas and more community sharing. And that my friends, is the magic. Sushmita told me that, when she started telling people she had a studio, artists suddenly were everywhere. I was reminded of the line from the movie, Field of Dreams, “if you build it, he will come.” People she had known for years and had never known were creative started talking about their art. And people who thought they didn’t have time, or weren’t good enough, were suddenly being validated by the least cynical person I have ever met. And her friends, and her family, and her community. We suddenly had permission to be “out” as artists. We no longer had to remain hidden and ashamed of our stories. We have a place now to take time out and PAUSE to experience the Art of ourselves and others, to Understand the people around us, their celebrations and their struggles, to Share our stories and to listen to the stories of others, and to Explore our emotions and senses as they are awakened through the magic of this place. Sushmita, by believing in her own art and stories, brings out the artist in all of us. 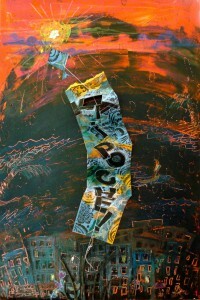 By creating a space where art and stories are encouraged, she has unblocked this writer, and this is only the beginning! So please, come in and enjoy a Community Pause. Share one of your own stories. Perhaps your honesty and courage will unblock someone else. Perhaps we can spread the magic even further. Pause. Create. Two verbs. Too rare. A blog post written for Studio Pause by Karen Leggett, author of Hands Around the Library. There is nothing commendable at all about the federal shutdown – too many lives and projects have been left hanging. But I did take the time afforded by the furlough to visit StudioPAUSE on a weekday, for a BookPAUSE session. Sush offered black Sumi ink, a brush and a very large piece of art paper. “Write a scary word,” she instructed. 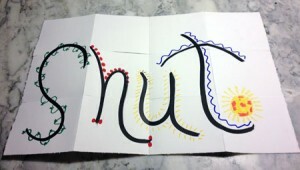 She was decorating her own word at the same time, mingling casual instructions with familiar conversation. There was an assumption that no matter what the instruction, I would and could comply. That assumption was comforting and empowering. There was never a moment when “I don’t think I can do this” would have been the right thing to say. I tried not to overthink but I didn’t want all my decorations to be gloomy, even though that’s the way the shutdown made me feel. So I mixed it up. Now time to fold the large paper along a grid. Then cut along the grid, three squares here, two squares there. And fold again, this time into a book shape, each fold creased hard with a nifty bone folder tool. With no advance clues about where each letter or page would fall in the book, here is what happened. My eyes – Sush’s eyes – burst with amazement at this somewhat trite but almost surreal discovery. In the midst of a shutdown that makes me see angry red, my creative moment offered a glimpse of bright sunlight. And the barbed wire was relegated to the back page. Carson found her wonders outdoors, but they can be anyplace where we brush away the brain clouds and find delight – letting a chance encounter blossom into a new friendship or a project, canoeing or picking apples at an age most people would consider elderly, trying a new food or dance or play, using a paintbrush on art paper instead of the bedroom or the woodwork. Pause. Create. Discover. Wonder. Be surprised. Life can never have too many verbs. What Will You Find on Monday Mornings? This week was our second Monday Morning Calm ArtPAUSE Session and I had one person stop by. Last week there were two people. 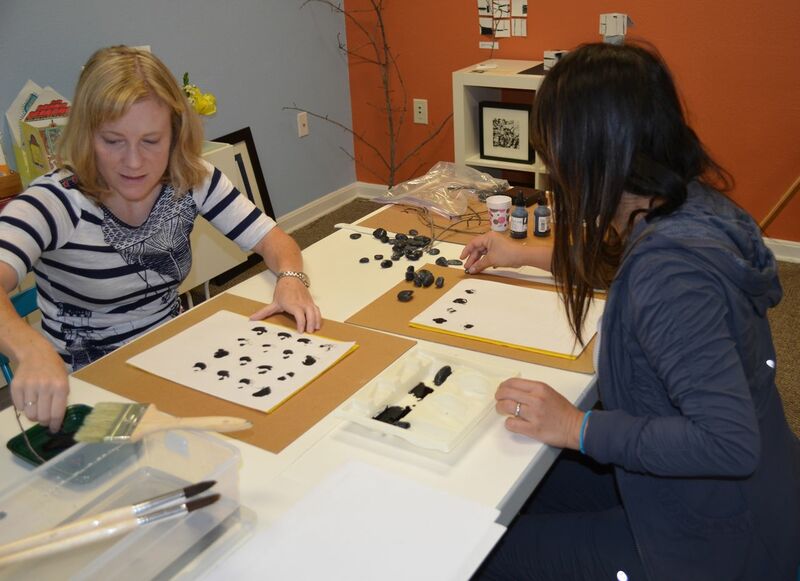 Have you ever been in a half-hour, one-on-one art session? Meredith plays with twigs. No, really! 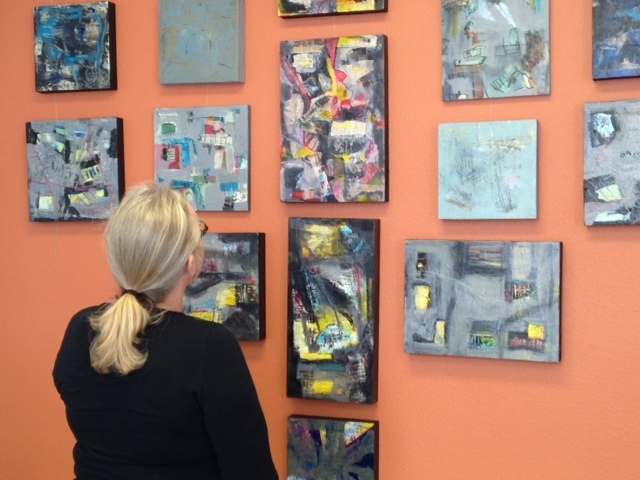 The first Monday, we explored the art done by Mary Louise Marino whose work is on display at the Studio this month. Titled Black And White And Lines, Mary explores black as her “color” of choice and uses various tools—all gathered from the hikes she goes on. I couldn’t forget that part of her artist’s talk. It was amazing to think that you can paint without using brushes and without spending money on colors! Have you ever thought of that? So I pulled some pebbles from the bottom of my flower vase and broke some twigs from a fallen branch on the way home and planned my first Monday Morning Calm session. The first Monday Meredith, who works as the Education Program Manager at Glen Echo Park Partnership for Arts & Culture, Inc. in Maryland, dropped by. Then came Vanessa, my hairdresser of fourteen years. Both had been at the opening event and had heard Mary’s talk. So they were ready to try working with pebbles, twigs, and the color black. This week Vanessa stopped by and found me reading old newspapers, typical morning stuff I guess. Except these were old papers another person who comes for painting sessions had left behind to cover the art table with. 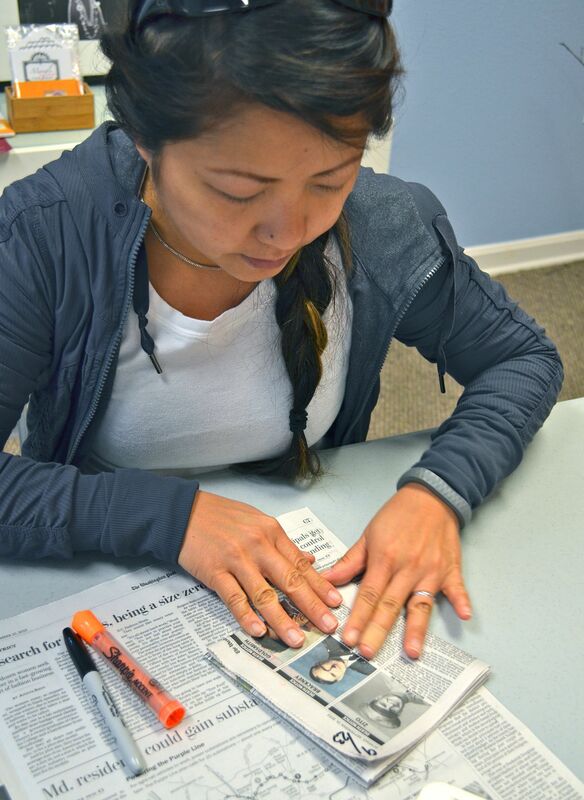 But newspapers work with the theme of Black And White so I showed her how to make a quick origami book out of old newspapers. The first step was the hardest. Which page do we pick? I picked one with a disturbing story about how people are getting desensitized to photos of suffering children. I wanted to fold it all up and hide it away. I couldn’t look at the photos. Vanessa picked pages in color. She liked color, she said. But she picked the orbituary pages. 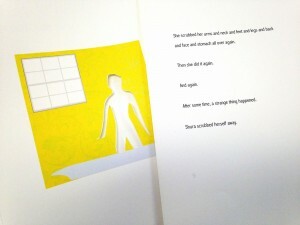 When the book was done we saw how the folding process put random images and text on the pages of our book. We circled words and images we liked with colored pens. We put the date on the cover of our book too, right next to the date on the newspaper. 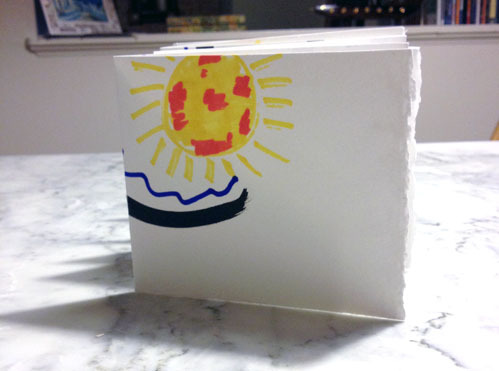 Vanessa thought she could easily make one everyday—a morning journal where you don’t write or draw anything! Just pick a page to fold into a book and then see the random things that show up. Then I asked her why she picked the orbituary page, pages I never read. She said simply, it had to do with her work. She was a hairdresser in Clarendon. She had many many clients, many of them regulars. But they come and go—some move house, change jobs, and … worse. So she reads the orbituary pages just in case she finds a client who hasn’t been in for a while. All the time hoping she doesn’t find a familiar face at all. Lesson Two: Inspiration is Everywhere. Stay open to it and watch where it takes you! Yes, it’s a delight to see grown-ups play, smile, laugh, have their eyes light up with ideas, and look at their work with pride. It is also amazing to hear them share bits of their lives, their loves, and their fears.